From a very young age my oldest daughter Lil' L was interested in creating. She would happily sit at her table and chairs to draw, paint, and sticker works of art. My husband is an artist (both at heart although only currently doing it commercially by profession) so I figured she came by this naturally. 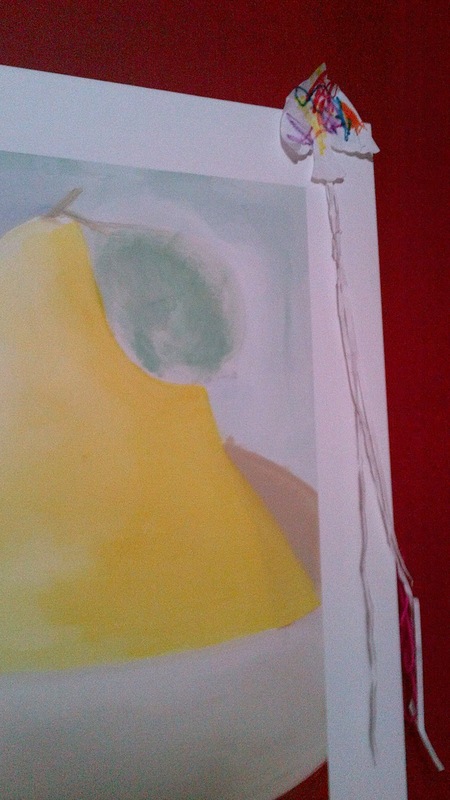 Personally all my creativity is in my head sadly, it never makes it on to paper looking the way I envisioned it. We have always believed that we should nurture our childrens interests by providing them with whatever opportunities we could to explore their current passions. When Lil' L was 2 1/2 years old we took a trip to Ottawa and visited the National Art Gallery, we wandered around looking at the incredible collection of artwork. Lil' L being a toddler didn't have a long attention span so we moved through the gallery quickly, I am sure to my husbands dismay. What really intrigued me was that I really didn't know if Lil' L was "getting" much out of our visit until part way through she told us that seeing all this art made her want to do creative. Luckily for us this must happen a lot because they have an area for children to work on art projects. We created a bird kite that hangs in our playroom to this day. I was thinking of this the other day when I took both the girls to the Royal Botanical Gardens to see ZimSculpt which is a collection of hand-craved sculptures created by artists from Zimbabwe. If you haven't had an opportunity to see this amazing collection of artwork, I would urge you to go (it's on to Oct. 8). Not only are the artists works on display, the artists are also present and creating on-site which means you have an opportunity to view them at work and speak to them about what they do. At first Lil' L was not keen to leave the fish in the RBG to look at art but once outside, she became interested and starting asking lots of questions about what made them decide to make something, if the people and things that were sculpted were from "real life" or imagined and so on. In the end what she really wanted to do was get home so she could make some art like that. 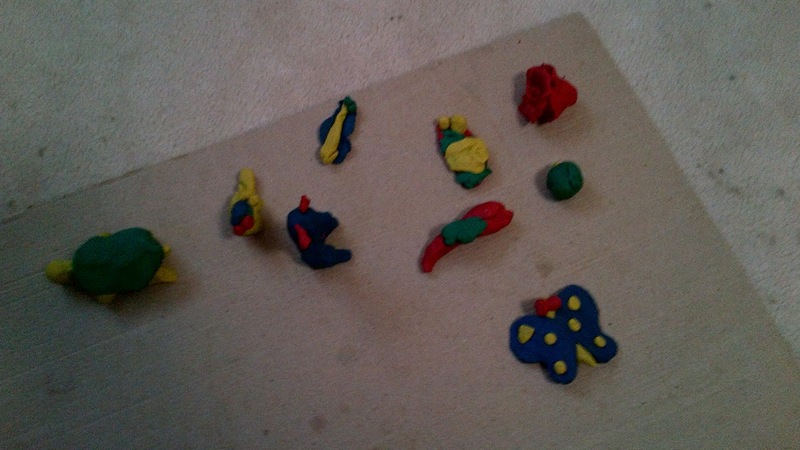 We now have a fine collection of clay sculptures created by Lil' L and her dad. Over the years I have saved almost ever piece of art that both my girls have created and if I keep it up I'll probably be featured in an episode of Hoarders some time in the future. My collection includes "love" cards, drawings, scribbles and so much more - lots of happy memories boxed and stored. Then something new happened. As Lil' L neared her 5th birthday she began asserting her independence and decision making abilities usually at bedtime when we were all tired and short on patience. 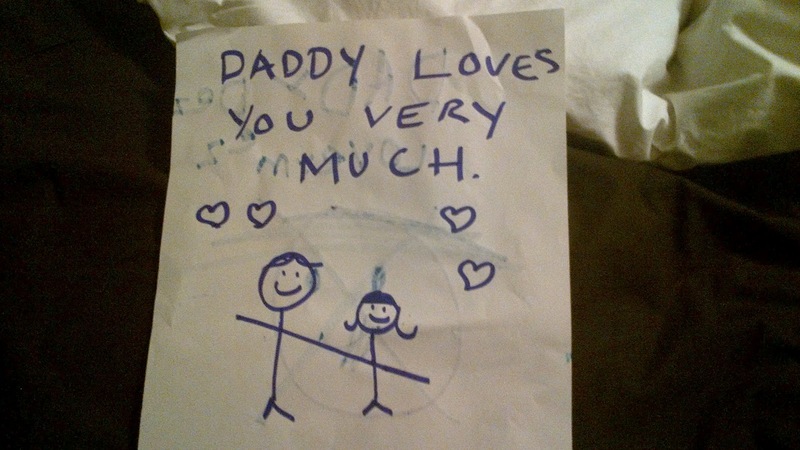 One night after a particularly rough bedtime my husband came downstairs and showed me what had been left outside Lil' L bedroom door for him. 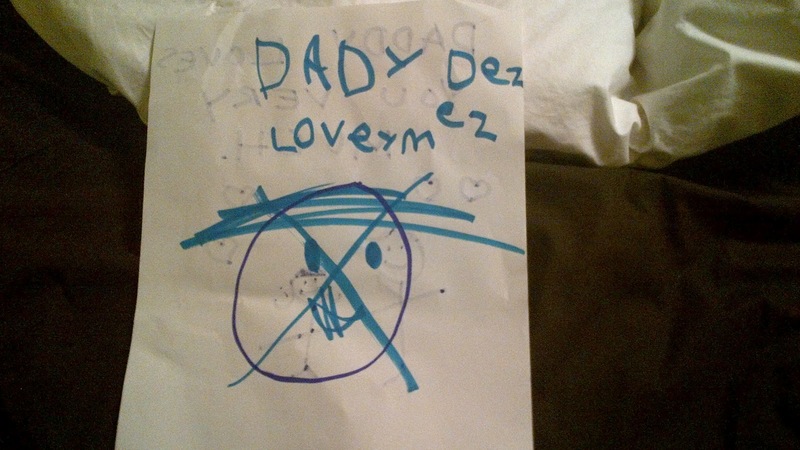 A drawing of his face x'd out with the words "Daddy doesn't love me" - it was both funny and heartbreaking. But I give my hubbie credit, he got a marker and drew her a return note telling her that he loved her very much with a picture of the two of them. Since that day there have been many a note left for the unfortunate parent that doesn't bend to the will of our daughter and even her little sister felt the brunt of it after losing one (of hundreds) of her plastics rings. Lil' L asserted that she did it on purpose and that the ring was very special to her, even though she had given it to her by her own free will just hours before. The next morning, several signs were taped around the house staking claim to her bedroom, the playroom and even the bathroom! The good news is Lil' E can't read yet. 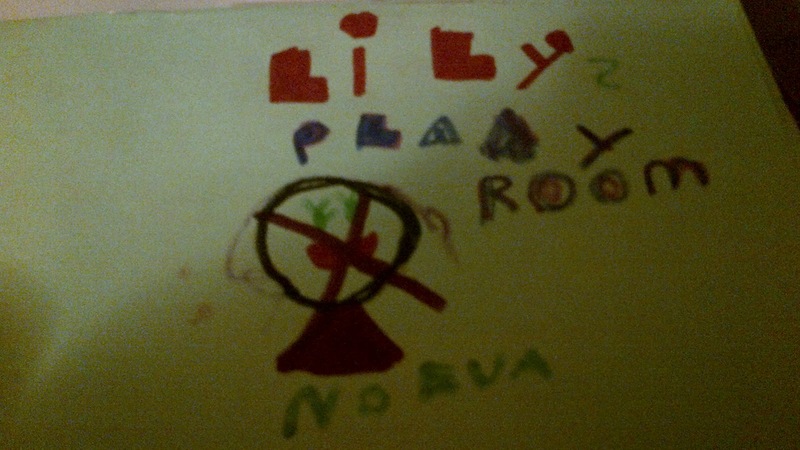 Lil' L has also used art to prove her point. After the rover landed on Mars, Lil' L was telling her classmates at daycare about it and they didn't believe her. She tried to explain to them that she had seen pictures of the "robot" on the computer and it really was on Mars but they weren't convinced. 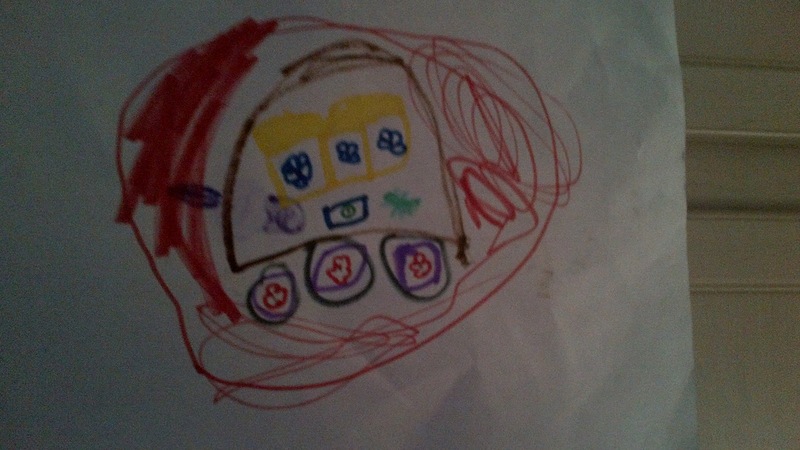 So Lil' L drew them a picture of the rover so that they would understand what she was talking about. Today that photo hangs on our fridge. The other night Lil' L and I were chatting at bedtime and she told me that sometimes she does things that she has been told not to because she wants to do them and not doing them makes her unhappy. Then she thinks "what have I done" and she doesn't know how to talk about it so she draws a picture and leaves it for us. She continued to tell me that she talked to our special friend (one of her dolls I believe) and she told her that family is the most important thing and we need to work together. As she shared this story with me, I thought how glad I am that she has an outlet to express how she's feeling and that she understands why she is doing it. I hope this serves her well in the future although I fear the pictures I might receive during the tween/teen years. 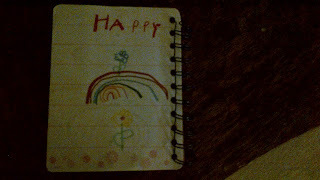 Don't get me wrong, Lil' L still creates lots of art work about love and happiness and just random stuff. I found a drawing in one of her many notebooks just titled "happy". If you are looking for some ways to share art with your child (6 and under) and you live in the Hamilton area I would encourage you to visit Mohawk College Ontario Early Years Centre when they have the artist in the centre. I think it is still Monday and Wednesday but check with the centre to be sure. Mr. Jason is the artist/educator in the centre and he had a profound effect on Lil' L. We visited almost weekly during my maternity leave and she still asks to visit to see him. Jason takes a very child centred approach to art, he doesn't tell them what to make or how to make it instead he asks them questions about what they want to do and allows and helps them explore how to get to the finished piece. Many children worked on pieces over a long period of time, adding and creating with each visit. Every Monday Lil' L would think about what she wanted to make and then head in to work with Jason to create it. I cannot say enough good things about this program. I am not sure if other OEYC offer these programs but it's worth checking (bonus: they are free of charge). From dollar store glitter glue to the many awesome products by Crayola, my children seem to be happy to create. I hope both my daughters continue to enjoy the arts and we will continue to provide opportunities for this to happens.